Abnormally dilated varicose and spider veins will affect the majority of adults. There are associated symptoms, and the unsightly nature can have a negative impact on self-image. Many vein disease suffers resign themselves to discomfort and altered lifestyles, but modern treatments offer solutions. Vein sclerotherapy, endo-venous laser treatments, and VenaSeal are safe and effective treatments. Transform Clinic’s initial consultation includes an ultrasound scan, which will show the severity of the problem, and treatment options will be discussed. These include Ultrasound guided sclerotherapy, Endo-venous Laser, or Venaseal, or for superfi cial veins injection sclerotherapy or laser. For more information see www. 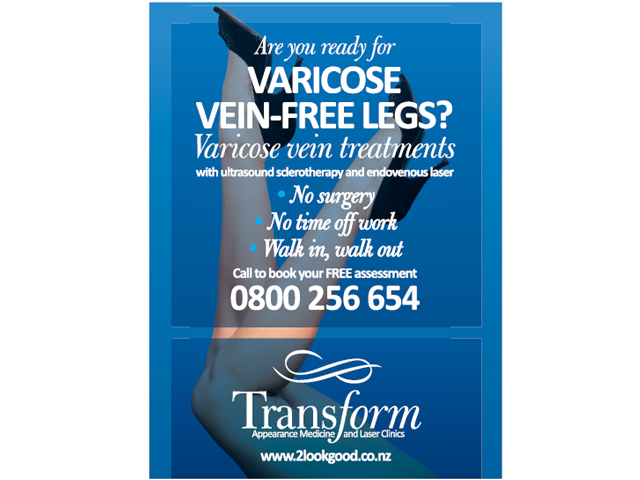 transformclinic.co.nz, or call 0800 2lookgood (0800 256-654).